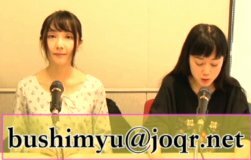 This was the first broadcast of Bushiroad Music Party. The opening song was "Shuwarin Dreamin" by Pastel Palettes. 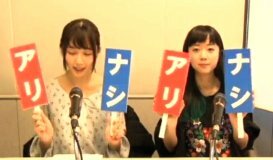 Sawako and Haruka explained that this program was about Bushiroad music. Then they played "Kizuna Music" by Poppin Party, which was the opening song to Bang Dream 2nd Season. They just played the first verse of the song. Since this was the first broadcast, they explained some of the corners of this program. 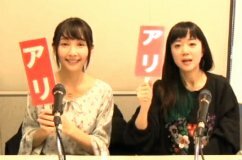 The corners were based on mails (questions) from listeners, but since this was the first broadcast, they did some samples. Sawako said that she usually doesn't wear make up, and usually wears the same clothes, if it's not a job where she will appear in front of people. Haruka also said that she doesn't wear make up if there are no photos or videos. The second song they played was "Brave Jewel" by Roselia, which was also the opening song to Bang Dream 2nd Season. 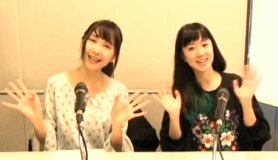 The third song was a request by Haruka, "Don't Look Back" by Haruka and Aimi (Rummy Labyrinth), which was the ending to the anime Card Fight Vanguard. The ending song was "Hidamari Lord Knight" by Roselia.